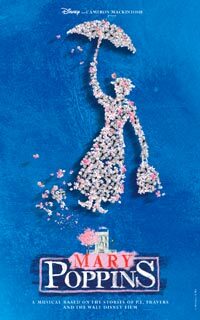 Cameron Mackintosh's stage adaptation of Mary Poppins had its world premiere at the Bristol Hippodrome starting with previews from September 15, 2004, before officially opening on September 18 for a limited engagement until November 6. The production then moved to the Prince Edward Theatre on December 15, 2004. The role of Mary was played by Laura Michelle Kelly, who subsequently won the 2005 Olivier Award for Best Actress in a Musical for the role, and the role of Bert was played by Gavin Lee. Notable replacements have included Scarlett Strallen and Lisa O'Hare as Mary Poppins and Gavin Creel as Bert. Prince Edward Theatre 2005 The show sparked mild controversy not long after its debut when producers Cameron MacKintosh and Thomas Schumacher banned children below 3 years old from entering the theatre, deeming the show too scary for young children. The ban remained throughout the show's entire run, during which the theatre staff were to prevent patrons with children below 3 to enter. The show was officially tagged as being "for children seven years and up". On March 17, 2005, Julie Andrews, who played Mary Poppins in the film, visited the show as a guest. She appeared onstage during the curtain calls, where she gave a speech recalling her own memories from making the film and praising the cast for their new interpretation. A studio recording featuring the original London cast was released in April 2005. The album contains most of the songs from the stage show, but omits a few, including Precision and Order, Cherry Tree Lane Part 3 and many of the Chim Chim Cher-ee interludes. The production closed on January 12, 2008, after a run of more than three years.